Scott Wegener gets a hair-raising experience while trying to obey God’s fifth commandment for 28 days. It was quite evident that neither of us wanted to be around the other. But if I didn’t change his light bulb, he’d probably die that night. I use the term he loosely, because it isn’t that easy to tell whether a snake is male or female. He was coiled around a burned-out light bulb, which usually kept him warm, and now he was striking at me every time I got near his cage to change it. Looking after creepy-crawlies isn’t the kind of thing that thrills me, but I found myself in this position as part of a challenge to honour my father and mother for 28 days. Have you ever thought about how you actually honour your parents? It’s actually one of the Ten Commandments of God. You’ll find it in Exodus 20:12: “Honour your father and your mother, so that you may live long in the land the Lord your God is giving you.” Being a part of God’s law, it must be an important request from Him. The way I chose to honour my parents was to take up their professions for 28 days. My career of making websites doesn’t dovetail with either of my parents’ careers, which no doubt disappoints them I believe, even if only to a small degree. Having a turn at their careers would have been a lot easier had my parents been reviewers of say, roller coasters. But alas, no. My father was into wildlife, my mother taught piano and here’s what happened. My dad started his own business as a wildlife lecturer. That involves taking live animals to schools and teaching kids about them. He was going to South Africa to shoot some lions and elephants (with his camera) and needed someone to feed his critters while he was away. This was a chance for me to step up and be zookeeper for a month, just like Dad. How hard could that be, right? Being winter meant that I needed to make sure the snakes kept warm or they could die. Hence the snake and the defunct light bulb. In addition to changing light bulbs, the other reason I had to open each snake’s cage was to fill the container that held their drinking water. What do these really mean? If I point a gun at you and said it “shouldn’t shoot,” that doesn’t instil much confidence! After all, if it did shoot, it would kill you. As for “safe snake,” well, this happened to be the sign on the cage of the snake that was striking at me while hanging from the light fitting. Fortunately, Striker, as I named him (or her), had moved when I went back an hour later, so I could change the bulb without acquiring a hundred or so tooth holes in my hand. Then there were the animals that required me to feed them live cockroaches for lunch. Dad had devised an ingenious method for catching the critters from his breeding box without having to touch them. He had placed old toilet roll tubes in the box under some cardboard sheets. When he (and I) lifted the cardboard and they all scurried for darkness, some of them would invariably end up inside the toilet roll tubes. I simply had to pick up the loaded toilet rolls and shake them into a jar, which was the transportation to their various dinner dates. This worked most of the time, but occasionally they decided that up my arm was a better direction to crawl than being dropped into the jar. This helped me learn that it isn’t a good idea to drop a toilet roll full of cockroaches on the floor. I did catch most of them before the last two crawled under some cupboards. Dad also had a collection of spiders that needed feeding, which I had three main issues with. For the bigger spiders, I had to get the container opened and food in and closed before the spider ran up my arm. The smaller, slower and poisonous redbacks had attached their webs to the lid, so when I opened it, the spiders came out of the container with it. Finally, there were containers that had hundreds of babies hatched inside them and trying to keep them all in the container at once was a challenge. I hoped that any spiders which did escape could go hunt down the cockroaches that got away. There was also a cage of large grasshoppers. The tricky part of servicing these bouncy creatures was opening the cage, which was at face height, and replacing the little tree branches they fed on, without all of them hopping out of the cage while it was open. I kept my mouth closed tight for that task. By the end of my zoo-keeping stint, I still had all my fingers and had survived relatively slime free. All in all, I can’t say I enjoyed the experience, but I know my dad really appreciated my help. And, I guess, things could have been worse. He could have had leeches that needed to be fed! Next it was time to have a go at Mum’s profession. She was an after-school piano teacher. She taught me piano when I was a child, but when I got to the part where I needed two hands, I threw in the towel. So to honour my mother, I decided to start taking piano lessons from her again—some 25 years after quitting. And one of the requirements involved performing in public, regardless of the outcome at the end. I was never that good at music practise. I would get very frustrated if I couldn’t get something right within four or five attempts, and having a mild case of dyslexia probably didn’t help my music reading, then or now. After a few lessons, which I thought I finished quite well, things started to get hard! Have you ever seriously thought about how amazing piano players are? They’re not reading and playing just one note at a time, but two, four or more notes. These notes are displayed on two different bars, one for each hand, and you have to allocate the correct fingers as you go. Furthermore, the note for one finger may need to be held down longer than the others and each one needs its own length of time and emphasis. All this I could cope with if I didn’t have to play two or more sets of the notes every second! It’s a huge credit to the skilled pianist how they achieve this multi-tasking wonder! But the worst part was that after 28 days I had to give a public performance! The hour finally arrived, and believe it or not, I got a standing ovation from the audience. Admittedly, I was playing “If You’re Happy and You Know It” in the zero-to-four-year-old class at my church. But I took it as affirmation. Now the 28 days are up and I’m continuing with my piano lessons. Monday has turned into “Mum-day.” As for looking after the creepy-crawlies again, maybe if I buy a thick pair of elbow-length gloves and a full face mask, I’ll be more relaxed. The whole process has probably raised more questions than answers for me. Like, Why do the Ten Commandments ask you to honour your parents but not your partner or your kids? Is it enough to just be nice to your parents, refraining from cursing their name or publicly humiliating them, or is there more to it? 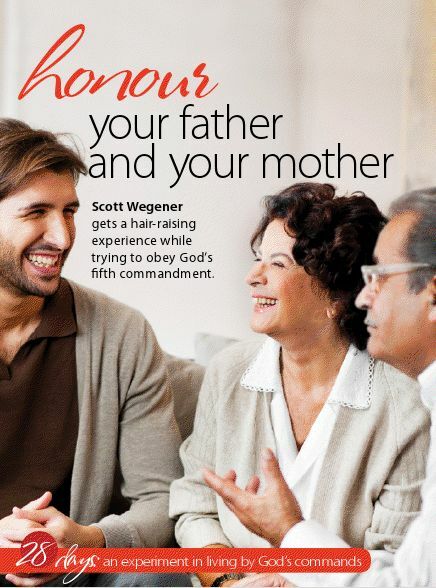 And is it fair that people who’ve buried their parents have only nine commandments to keep? Some people probably think that honouring their parents means taking the time, money and effort to care for them in their old age. That certainly is one way to honour one’s parents. However, I believe that honouring one’s parents has as much to do with the little things in life as it does the big things. When I send my parents a birthday card, I’m honouring them. When I call them on the phone for a chat once a week, I’m honouring them. I believe I honoured my father when I helped him by caring for his exotic pets. My mother really enjoyed giving me some piano lessons and I honoured her by spending that time with her. So stop and think about little ways you can honour your parents. Think of something you can do to honour them today. Call them, write to them or send them an email or sms. Visit them in their home or invite them to yours. Take them out to dinner or on a day trip. Reminisce with them over old photos. Forgive or apologise for a past incident. Care for them in their times of need. Take holiday trips with them. Get involved in their hobbies. Ask them to move in with you. Discover a new bug and name it after them.